These freezer-friendly breakfast frittatas will simplify your morning routine and let you enjoy a taste of Sunday brunch any day of the week! Now that we’re all back to work and back to school, time is in short supply. This month’s recipe redux theme, freezer-friendly meals, couldn’t have come at a better time. I decided to do a breakfast option because… well who couldn’t use few extra minutes in the morning? Many of my clients struggle to include protein at breakfast. And I get it. It’s easy to grab a cereal bar, a piece of toast or nothing and run out the door. 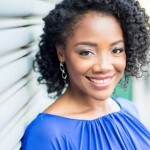 But when it comes to weight management and especially weight management after a certain age, protein is essential. While a boiled egg is one of the easiest ways to get that satisfying protein, it’s a missed opportunity. 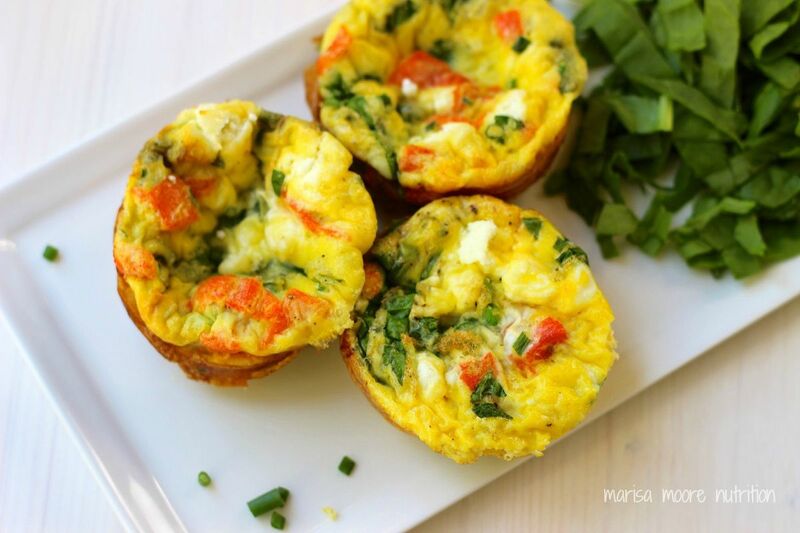 With just a little more effort you can put breakfast on autopilot and enjoy these vegetable filled mini frittatas for days to come. 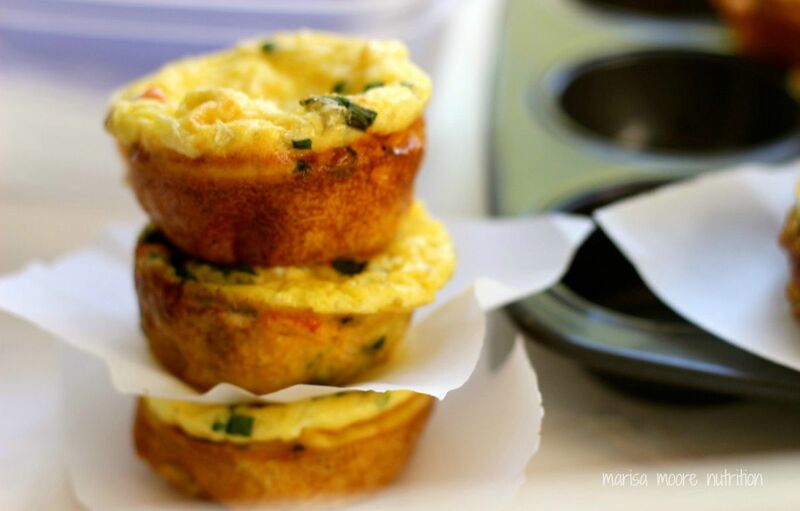 I first experimented with eggs in muffin tins back when the South Beach Diet was hot. (Some would call these egg muffin cups but that title bothers me for some reason.) You can use any combination of vegetables, cheese or meat. I decided to use smoked salmon, spinach, shallots and goat cheese in this version. This Smoked Salmon & Goat Cheese Mini Frittata recipe is an easy way to sneak in a serving of vegetables and a dose of heart-healthy omega 3 fatty acids first thing in the morning. The savory, salty smoked salmon is perfect paired with the creamy and tangy goat cheese and mild onion flavor from the chives and shallots. I added the chives for color and used shallots instead of onion to keep the onion flavor from overpowering the frittata. I’ll admit. These little egg pies are not the prettiest… but they are tasty! 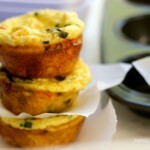 These mini frittatas are perfect right out of the oven but keeping with the theme, they also freeze well. Just add a square of parchment or wax paper between each frittata to keep them from sticking and store in a freezer safe container. 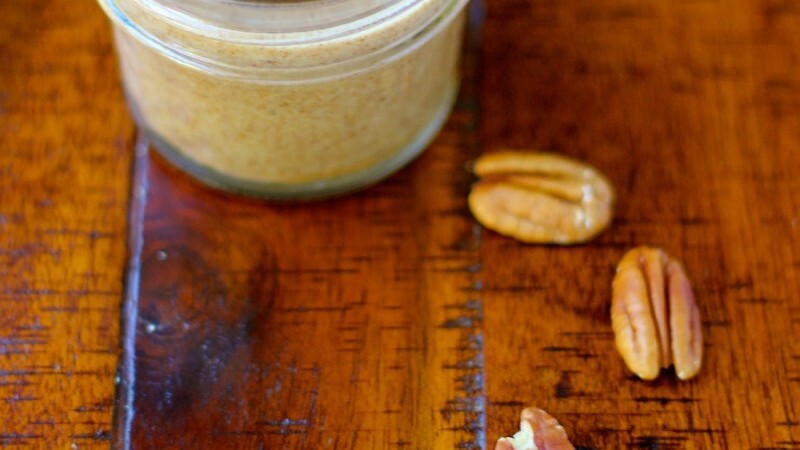 This recipe is perfect for meal prep. 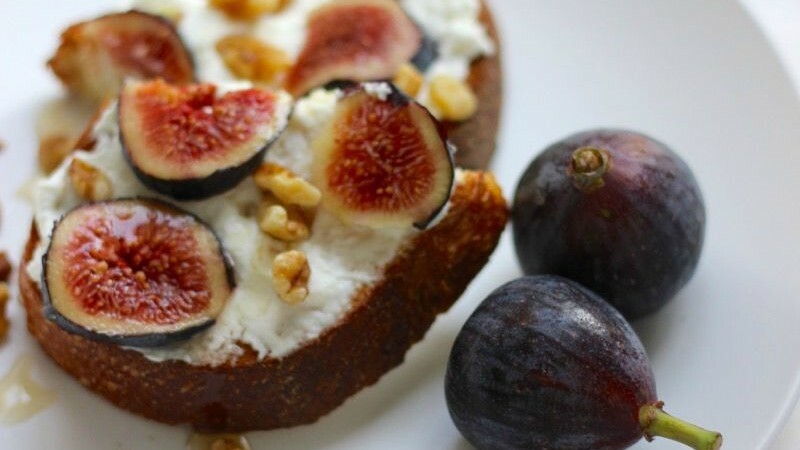 Make a big batch on Sunday evening for a quick breakfast throughout the week. To reheat: I tested these out by reheating them in the toaster oven and (reluctantly) in the microwave. I strongly recommend the oven if you have the time. The frittatas get a bit of a crispy edge that you won’t achieve in the microwave. Plus there’s the little issue of heating smoked salmon (and eggs) in the microwave. I cannot be responsible for what goes down in your home or office if they find out you’re the one who heated fish in the microwave. So yeah… don’t do it unless it’s an emergency – meaning your fridge and pantry are bare and Starbucks is out of oatmeal. I kid a bit here. Really. The slower method is preferred but the microwaved version was not bad at all. I heated the mini frittatas on 50% power for about 2 minutes and they were still delicious. Preheat oven 350°F. Spray or grease 12 cup muffin pan with oil. Set aside. In a medium mixing bowl, beat the eggs with cream, salt, pepper, and shallots just until combined. Add shredded spinach and smoked salmon evenly to the greased muffin cups. Pour in the egg mixture, filling each cup almost to the top. Sprinkle with crumbled goat cheese and chives. Bake 20-22 minutes, until set. Remove from the oven. Let cool about 5 minutes in the pan. Then transfer to a cooling rack to cool completely if not serving immediately. Freeze the extras: Separate the frittatas with parchment or wax paper and store in a freezer safe container up to 3 months. 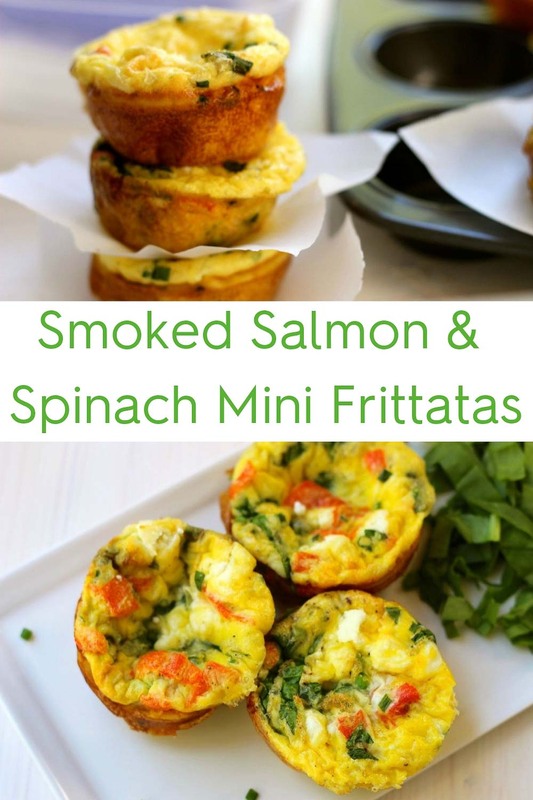 Enjoy the mini frittatas for breakfast or lunch with a salad. To reheat: Reheat in the toaster oven at 350°F 15 minutes or microwave at 50% power about 2 minutes or until hot.